All paid plans can download an unlimited number of SCORM objects for use in a third-party LMS. All paid accounts have the ability to download unlimited SCORM files for use in a third-party LMS. Instead of restricting the number of files you can download, we’ve put a fair usage limit on the number accesses to SCORM your plan can have each month. By doing this, we’ve removed the complexity of account holders having to pay an additional fee for unlimited downloads and multiple domains for SCORM files. Please note that you can host your SCORM objects on as many domains as you like. 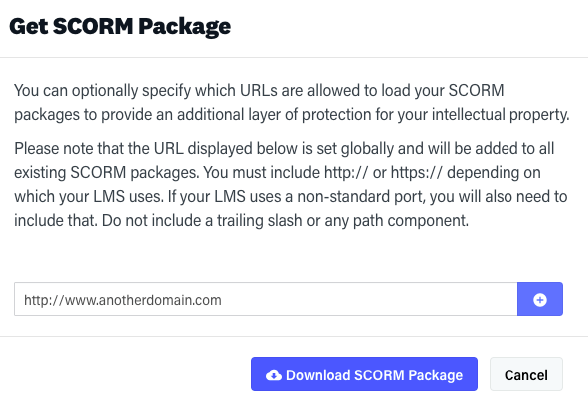 By default, your SCORM objects will work on any domain. If you'd like to restrict access to specific domains, add those domains to the domain field input field when downloading your SCORM package.